Scone success at last! We’ve made scones before – they’ve always been sad and hard. I think the combination of a normally functioning oven and a good recipe made the difference. 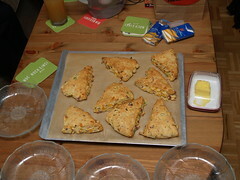 We might tinker with this in the future to make sweet scones as well. Combine dry ingredients. Add in butter and work with your hands to combine – make sure to work all lumps of butter into flour mixture. Add cheese, green onions, and buttermilk, and mix together. Add bacon and egg and mix until all the ingredients are incorporated. Turn dough out onto a floured flat surface and knead a few times to smooth out the dough – it will remain lumpy and sticky. Form dough into a ball, then flatten into a 1/2-inch thick disk. Cut the disk into wedges (we got 8). Spread wedges across a parchment-lined baking sheet, leaving a little room around them. Bake for 16-18 (we went for 20) minutes, or until the bottom of the scones start to brown and the cheese in the scone begins to turn golden. Best served warm. 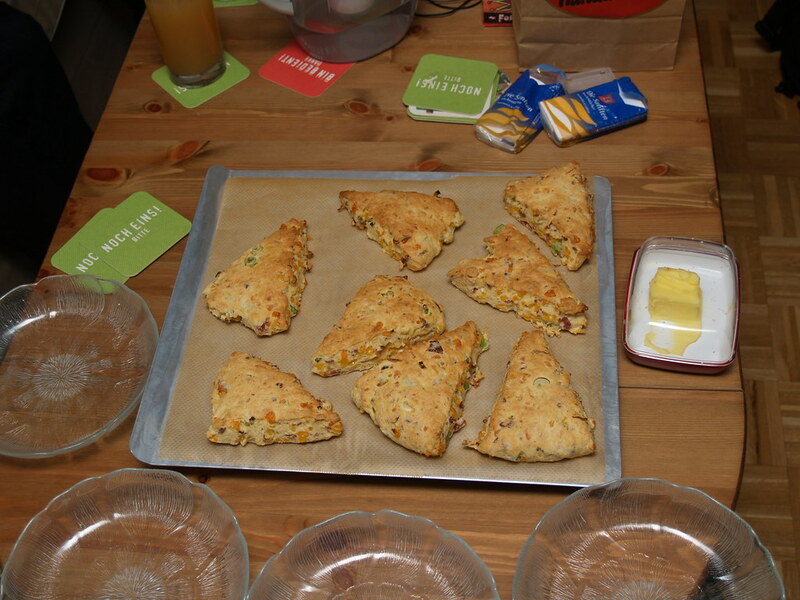 The perfect combo for the bacon fan, the cheddar fan, the scone fan! I’m not so up on the shorthand… is a big T one teaspoon, a small t a half-teaspoon? @Ian: They are fabulous, but they make 8 huge (kinda heavy) scones, so unless you’re serving 4 adults or more or all have giant appetites, I’d halve the recipe. In my recipes – and I’ve tried to keep this standard – T=tablespoon, t=teaspoon, c=cup and lb=pound. I think those are the main abbreviations I use, but if you see something else and you’re unclear on it, please let me know and I’ll clarify. how do you store your leftovers if you actually have any leftovers? Do you store them in an airtight container at room temp. Or do you refrigerate them? Ah, the abbreviations make more sense your way. Thanks! @Tammy: We’ll need to make more to see how leftovers fare. :D I would sooner put them in an airtight container at room temp. than the fridge. @Ian: Good! I was afraid I was putting gobbledygook out there. @Margot: If the next batch keeps well, I’ll send some your way! Next Next post: Is the long, dark winter over?